In the 1985 work 'The Cat Who Walks Through Walls' by Robert Heinlein, Richard Ames makes the following internal observation; The character is in an underground abode. The accommodations are in a side room off of a main corridor. The atmosphere is appropriate for shirt sleeves, think of it like being in a large mall with heat and air, low gravity being the only noticeable indicator you are not on Earth. At one-sixth gee a rock shelf is softer than a foam mattress in Iowa. I went to sleep quickly. Would a lunar colonist find a rock shelf softer than a foam mattress? Would you only need a blanket and flat & level surface of solid rock to sleep comfortably in Moon's gravity? A good measure of comfort is how much external body pressure is induced from laying on a hard surface. Earth gravity is enough to cause an adult considerable discomfort when lying on a hard surface. Paresthesia, or the sensation of having arms and limbs falling asleep, would be a good standard to measure against to answer this question. The sensation can be felt with as little as 20 mmHg (2.9 kPa) or just 1/2 pound per square inch according to this detailed description from fact finding website TodayIFoundOut. One study from the Journal of Neurological Science "Effects of graded experimental compression on slow and fast axonal transport in rabbit vagus nerve" gives some details on pressure points including discussion of human implications. Any external pressure on the body in excess of 20 mmHg (2.7 kPa), or 1/2 lb per square inch, would be enough to make a mattress a necessity. The sleeping surface is flat, even, and hard. If you were sleeping on lava rocks, there would be some jagged surface points poking into the skin that might give isolated pressure points. The person sleeping is average weight and size at 62.0 kg or 136.7 lbs. Calculating the surface area of the body in contact with the sleeping surface will be a bit trickier to estimate. Again for the sake of argument let's assume that less than half of the body will be in contact with the surface, say 25% of the body. Ratios of body fat will give some ranges here too and there many calculations to choose from. Wikipedia shows average Body Surface Areas of men and women at 1.6 and 1.9 m2, respectively. Let's take the difference between men and women at an average of 1.75 m2 and 25% of that gives us 0.4375 m2 or roughly 4.71 ft2. So given the average weight at 136.7 lbs (62.0 kg) on Earth gravity, and assuming 25% body surface contact, laying on a flat surface will distribute the weight to 29 lbs per square foot (142 kg/m²) or 2.42 lbs/inch (43.2 kg/m). On the moon, gravity is 1/6th that of earth, so we can reduce weight to 23.8lbs. Our mass however does not change, it's still at 62.0kg so applying moon gravity (1.6249 m/s2) gives us a force of 0.101 kPa or just 0.756 mmHg or a cozy 0.015 lbs per square inch, not enough to induce Paresthesia. While it may not be "comfortable", it would not be uncomfortable. 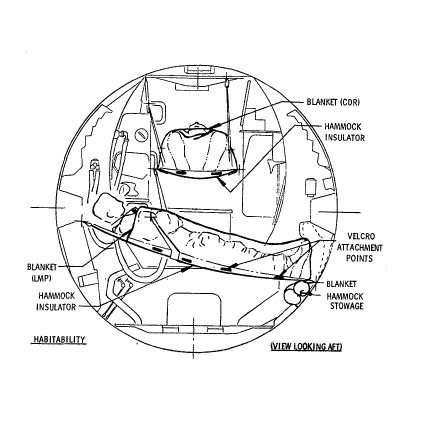 A purely hypothetical answer of course--one would have to actually simulate 1/6th Earth gravity to test and in an interview with Space.com, the crew of Apollo 12 recalled what little sleep they had with little mention of physical comfort albeit they had hammocks to sleep on. Something else to keep in mind: People can comfortably lay on a bed of nails given enough surface area. Comfort, of course, is subjective, but we know it is possible in Earth gravity. (http://entertainment.howstuffworks.com/arts/circus-arts/bed-of-nails.htm) Given this observation, it is not a stretch of imagination to assume this would be painless enough to sleep on given 1/6th Earth gravity on the moon. A rock surface might or might not be comfortable, but certainly there are lighter and more compact alternatives to mattresses that would be comfortable in lunar gravity. Not the answer you're looking for? Browse other questions tagged colonization lunar-landing habitat myth-busting sleep or ask your own question. Are there any resources available on the moon that could make a base commercially viable?